Gay has been researching and weaving coverlets for over twenty-years years. She is fascinated with nineteenth century coverlet patterns and weave structures and uses her research as her inspiration for her artistic interpretations. In recent years she has concentrated most of her research on coverlets woven by Pennsylvania German weavers who have left a legacy of handwoven coverlets and handwritten pattern manuscripts. For designing her own work, she combines the interplay of block designs and weave structures with the use of weaving software. She is also fascinated with the fringes used to frame the early coverlets. Some are simple and elegant, while others are more elaborate. Gay returned in 2005 to her coverlet pursuits. As the chair for the Early American Coverlet Study Group she publishes and writes articles for the group’s newsletter. She also regularly contributes to the Complex Weavers Journal and in the past year has written articles for Shuttle, Spindle & Dyepot. Gay also shares her interests through workshops and presentations. Description of Workshop: This is a master's class in weaving coverlets fringes. While we will be examining the fringes used on nineteenth century coverlets, the same techniques can be used for other types of weaving. We will explore both simple and elaborate fringe techniques. Some are woven with the coverlet, while other are woven separately and sewn on. One simple technique allows us to have the colorful wool fringe on the bottom of the coverlet as well as the two sides for float work coverlets in order to create an artful framing of our work. We will be weaving tape fringe, weft fringe, leno lace fringe, parallel and diagonal tied fringe as well as bands of plain weave fringe to name a few. Gay is always finding new techniques used on this early art form and welcomes the opportunity to share what she has found. Title of Presentation: Early Point Twill Star Coverlets: A Living Statement of the Creativity of Pennsylvania German Weavers. Description of Presentation: Pennsylvania German weavers enlarged and modified the German Hin und Weider Arbeit star motifs in order to create interesting coverlet designs. This talk will focus on the point twill related patterns and weave structures found in extent coverlets and early manuscripts. By connecting a pattern from an early coverlet to a pattern in a manuscript, it is possible to determine who might have been weaving certain related patterns, as well as what, where and when they were weaving them. For discussion purposes the motifs and weave structures are categorized into five groups (1) Nine Stars, (2) Rose & Star, (3) Stars & Flowers, (4) Window, and (5) Dog Paw. 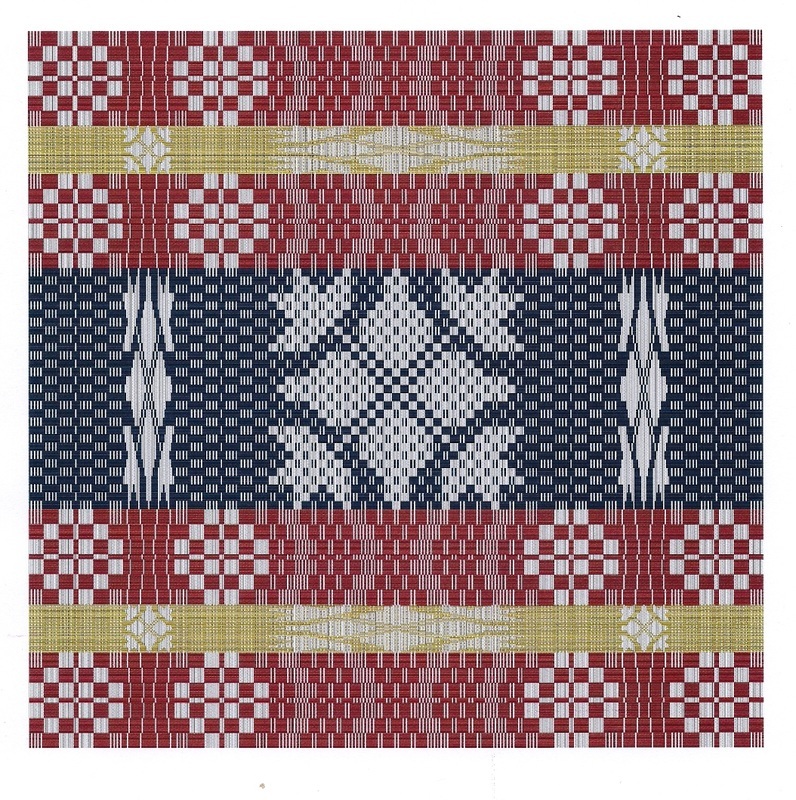 Description of Presentation: Gay sees weaving software as an important tool for designing her traditional coverlets. Other important tools are the theory of block design and block substitution. The same block design can be used for different weave structures to create a change from a bold design to one with muted colors and a subtle design. She will share her exploration into designing and drafting with blocks in a digital format (Fiberworks). Description of Presentation: Gay will share her research of early American nineteenth century handwoven coverlets. She has learned from the master weavers how to design, draft and weave coverlets by studying the extant coverlets and handwritten pattern and account manuscripts from the period. After all it takes a weaver to truly understand the work of the master coverlet weavers.